Now that I’m back working my day job, I have a lot less free time in my life. I generally work online for 2-3 hours a night after work and that severely cuts into my TV watching and forces me to be a lot more efficient when it comes to managing my time. So the last thing I want to do at the end of the night is spend my time scrubbing toilets or vacuuming my apartment. It’s a tough predicament for me since I do like a clean house but I don’t like cleaning all that much. I’m not a neat freak by any means but there are rarely dishes in my sink and even though I refuse to make my bed(since I’m going to get right back in it in 17 hours) I keep a pretty tidy household. I guess you could say I’m good at the routine maintenance type cleaning, the every day stuff. But when it comes to a deep cleaning, I absolutely dread having to do that. I’d much rather pay someone else to do it for me. I could never really justify a cleaning lady in the past since I had plenty of time to do it myself but now that I’m working two jobs, I felt like I was ready to pay someone to clean my house. I’ve tried out a couple cleaning services in the past that I found through Groupon and Yelp but I was never that happy with the results. With the first company, everything looked nice and clean when they were done but it didn’t smell all that fresh. I used a different company the second time around and while they did a great job, their price seemed a little steep. Now that I’m in Orange County though, I needed to find someone new so I turned to Yelp. I read through a few companies and ended up narrowing it down to two services. They both had stellar reviews and they were only two dollar signs($$) on Yelp’s pricing chart. I figured that was a good indication that they would be cheap but not too cheap. When I called them though, they both quoted me at $30/hr and estimated that it would take four hours to clean my place. I was going to have to pay $120 for four hours worth of cleaning(plus tip), they were going to charge me $30 an hour! That might not seem like a lot to some people but for a majority of you out there, this number should seem pretty outrageous. $30 an hour is more than the average college graduate will make! I was so appalled by the first two quotes I stopped my cleaning lady search right there. I’m sure that both of these businesses do a great job and there’s a reason why they were both rated 5 stars with hundreds of reviews but I was pretty surprised that that many people were too lazy to clean their own houses. In fact, I bet a lot of them probably should be cleaning their own houses instead of paying someone else $120. I’ve always been a do it yourselfer so there are very few things that I will pay to have done without at least trying to do first. But when it comes to cleaning, anyone can do it and anyone can do a great job. It shouldn’t be that hard to find someone willing to clean for a reasonable price. Cleaning supplies aren’t very expensive and they’ll last you for years if you use them sparingly. I would understand if someone wanted to pay a vendor to fix their refrigerator or something of that nature(personally I’d try and do it myself first and then call someone if I fail) but I don’t get why so many people are paying so much for cleaning ladies. I think a lot of people forget that they’re paying for these services with after-tax dollars. It’s easy to say I make $30/hr so it’s ok to pay $30/hr to a cleaning lady since that’s basically a wash. But really if you were to do the cleaning yourself, not only would you be saving that $30/hr but you wouldn’t have to work and make $40-$60/hr before taxes. You can’t make this comparison with every type of service since most people don’t know how to fix a washing machine. But over 99% of people on this planet have the ability to clean, whether they know it or not. It probably makes sense to hire a cleaning lady when the cost of the service is equal to or less than what you make on a pre-tax hourly basis. If you’re willing to trade one extra hour at your job for one hour less of cleaning then it’s a decent idea to hire a cleaning lady. Personally, I wouldn’t mind paying around $20/hr for a cleaning lady and I think I’ve finally found one who fits the bill. The problem with all the cleaning services I was looking at before was that they all were small businesses. So they had lots of overhead and the cleaning ladies who did the cleaning probably didn’t see more than half of that $30/hr. I decided to look for someone who was basically their own one woman business. That way, there’s no overhead and the person you pay is getting most or all of the money in cash. Recently, I did end up finding someone who was willing to clean my place for $90. It’s not quite the $20/hr I wanted to pay but it’s definitely closer to what I’m willing to pay. Readers, have you ever hired a cleaning service or cleaning lady? Do you think it makes sense to pay someone $30/hr to clean your house when you only make $20/hr yourself? Quite frankly, I have never considered a cleaning service or a cleaning lady (man). It strikes me as an incredible waste of money and more pretentious – some people like to be able to say they have someone that comes by and cleans their place – than anything. According to the U.S. Census Bureau, the size of the average American home is 2,438 sq. ft. Does it really take that much time and effort to clean a home of that size. I think not. For those considering a cleaning service or cleaning man, you are probably a lot better off finding another 20 minutes or so a day and keeping your own home clean. Hi James, first of all, thanks for stopping by and commenting. I don’t think having someone come in to clean your place once a month or even once a week is pretentious AT ALL. We all have different ways of prioritizing our time/money and this is just one of them. Some people like to pay for a gym membership but they could easily get just as good of a workout running and doing body weight exercises on poles, benches, etc – there are millions of Youtube videos on the subject. Let’s say I hire a cleaning lady for $20/hr. I don’t think they’re going to do a better job than me but I would rather write an extra article for one of my freelancing gigs at $40-$50/hr than spend an hour or two cleaning. That’s one of the nice things about having a good job, you can pay people to do things that you don’t want to do and spend your time doing things you want to do(writing, exercising, etc). I think doing some of the dirty work on your own even if it would take you a week before you finish it all is better than paying for someone to do it for you. Sometimes taking matter in your own hands is the best thing you can do, you never know, maybe you get a hang of it and you clean faster the next time around. Hi Mark, thanks for reading and commenting. I’m not against cleaning and/or doing dirty work but I like coming home to a neat and tidy home. I know a lot of middle class families hire house cleaners once a week or once a month so I’m not sure what the big deal is. I truly value my time so I think it would be an immense waste of my time to spend time doing something I don’t like(cleaning) when I could hire someone to do it for me and spend that time working or doing something else I enjoy. They’re not going to do a better job than I am but to put it bluntly my time is worth more than theirs. Wow – did this hit home. Not long ago, when my MIL was visiting, my children (teens) asked why we didn’t have a house cleaner. My MIL chimed in with a “Yeah, why don’t you hire a house cleaner, you certainly can afford to do so”. Well, that just iritated me to no end, so without thinking, I spun around and said “because there’s a great deal of good to be learned from having to pick up after your own sorry a$$”. I really didn’t mean to come off that harsh, but that really is how I feel about it. I don’t care how much $ you make I personally think you ought to pick up after yourself. It keeps you humble and human. I agree with you that there’s a certain entitlement that comes with being served and picked up after. Although it’s nice once in a while(when you’re on vacation for example), it does keep you humble to pick up after yourself. But will hiring a maid to clean once a month or even once a week really have that much of an impact on your humility? Either, me or my fiancee still do all the day to day things like washing dishes, laundry, wiping down the counters, vacuuming, etc. Ride with the proletariats – that’s hysterical! If having your house cleaned was an occasional thing, as a reward for hard work – I’m with you. But as an every week/month whatever thing – no. Not with you on that. It just smacks of entitlement to me. My philosophy is and always will be: Get off your own sorry a$$ and pick up after it. Sorry, I’m a hard a$$ and I make no apology for it – although I am still laughing my own sorry a$$ off re: your proletariats comment – ha! p.s. just for clarification sake – I am not related to, nor do I know your previous commentor by the name of James. I can confirm that I am not related, nor do I know you, Mrs. Jim. However, agree with your sentiments and enjoyed reading your thoughts. This is something I have considered to do when debt is paid off but I don’t know I ever would because 1) im neurotic when it comes to how clean I want something and 2) dont know if it would be that easy to part with my money. I do pay fot car detailing though anf may pay someone for a specific job at home that I could do but dont want to/have time to do ( like paint/ yard cleanup). id rather pay someone to help me find time to clean (like a babysitter on a day off). I’ve had someone clean my place for over 20 yrs. She comes every other week and does a wonderful job. It’s not that I’m lazy or don’t have time but it frees me up to spend time with family, friends or other activities. 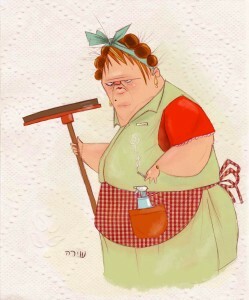 I’m lucky enough to have the $$ to have a ‘cleaning lady’. I have friends that would never use a cleaning lady. It’s a personal preference. For me, I have one and am very happy with this arrangement. Definitely a personal preference. I’m with you, not lazy but I don’t want to spend 2-4 hours doing a deep cleaning every month. I’d rather pay someone to do it for me and spend that time doing something else. That might sound a little snobby but I worked hard to get to the point where I have the flexibility to pay someone or do things myself. Well, I’m lazy and hate to clean. While I’ve gotten better over the years, as the book says, it’s your money or your life. Now, my situation is different in that I pay my (retired) mother to clean my house and she only does the 1st floor (and maybe the basement stairs once in awhile) while she is here being the pet-sitter. It’s a win-win. Mrs. Jim – you should have told your MIL that’s why you had kids – so you didn’t have to pay a cleaner. I remember being the channel changer, dish washer, lawn mower and garage door opener when I was a kid! You’re right – I should have told my MIL that that is why I had kids. I remember being the garage door opener and channel changer (among other things)too. These days, kids can’t even imagine you actually had to get up, move across the room and turn the dial much less imagine a garage door that doesn’t open and close by the mere push of a button. And yes, I did walk 2 miles to school, uphill both ways,in the snow without shoes. Teenage kids make a passable replacement for the cleaning lady. We’re in favor of mild exploitation of children for household chores. As long as you can close your ears to the occasional whining and bellyaching and the “my friends don’t have to do this at their house” comments, it tends to work out just fine.